It's not Thanksgiving without biscuits at our house. Sure, it may seem redundant to have yet another carb when there are already plenty of others on offer. I'm a big fan of quick breads for Thanksgiving and biscuits in particular. Drop biscuits, like the Cranberry-Walnut Drop Biscuits I shared yesterday make a great choice, since you mix the ingredients together, plop them onto a baking sheet and stick them in a hot oven. Very simple. Biscuits that are rolled out and cut are a little more work, but offer a more uniform look and a really nice texture. 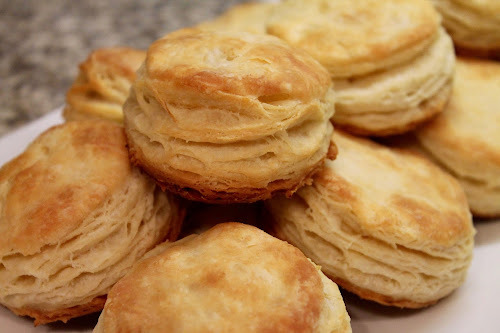 The Butter-Flaky Biscuits pictured at top are one of my favorites. The buttery dough is rolled out and folded several times, creating layers of buttery goodness. Rosemary, Onion and Black Pepper Biscuits pack a lot of bold flavors into a savory biscuit. Similarly, I love Cheesy Scallion-Corn Biscuits, especially with a Homemade Compound Butter spiked with fresh chives. 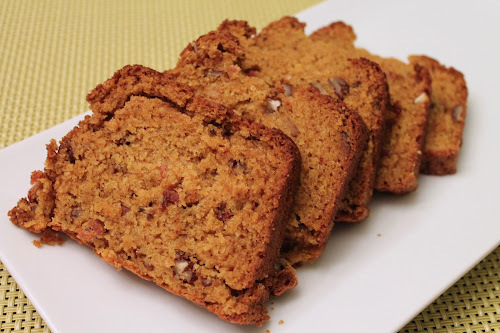 For something with a bit of smoke and sweetness, I recommend Butternut Squash, Pecan and Bacon Bread (pictured above), which comes together quickly if you roast the squash in advance. Lastly, although I usually make cornbread to cube into stuffing, Simple Cornbread is pretty amazing on its own as well.